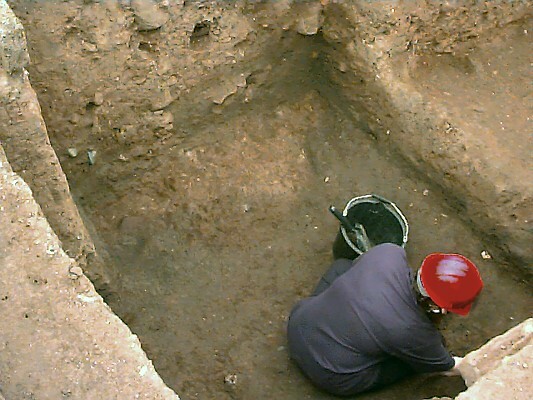 Bad Archaeology began as part of my personal website in 1997, back in the early days of the web. I was joined by James Doeser as co-author in 2007. The name was inspired by astronomer Phil Plait’s Bad Astronomy website (now a blog hosted by slate.com). James and I are fed up with the distorted view of the past that passes for knowledge in popular culture. We are unhappy that books written by people with no knowledge of real archaeology dominate the shelves at respectable bookshops. We do not appreciate news programmes that talk about ley lines (for example) as if they are real. We want to show that claims about alien DNA in ancient skeletons (for instance) are fraudulent. In short, we are Angry Archaeologists. You can read the blog alongside this site. Think of the main site as a work of reference (but, I hope, more accurate than Wikipedia). The blog is my editorial comment on news items. Archaeology is extraordinarily diverse. From the field technicians knee deep in mud in a Hebridean winter to the Classical specialist examining frescoes on a wall at Pompeii, from the geneticist tracing ancient bovine DNA to the linguist refining our understanding of Maya inscriptions, the range of specialisms and viewpoints is enormous. Nevertheless, there are commonalities of approach and boundaries to that diversity, united by what may be termed ‘the scientific method’. These boundaries are best explained by showing what archaeology is not. Someone who uses explanations that involve unknown civilisations, extraterrestrial contact, the inerrancy of religious texts or the operation of paranormal powers, belongs to a very different intellectual tradition from mainstream archaeology. The orthodoxy – itself a mass of contradictory, competing and often abstruse arguments – generally relegates these other investigators to a ‘fringe’ or ‘cult’ status, as a result their claims go unchallenged. We aim to explore the main strands of thought within the ‘fringe’ on this site. 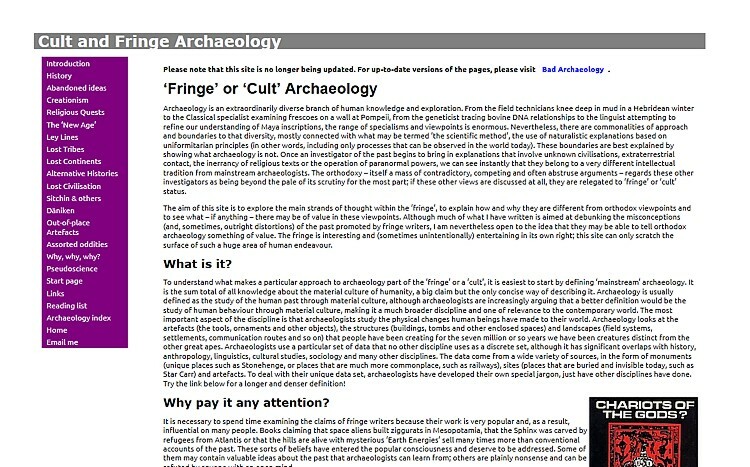 We want to explain how and why the ideas of the ‘fringe’ are different from those of orthodox archaeology. Much of what we write aims to debunking the misconceptions and distortions of the past promoted by fringe writers. Even so, we are always open to the idea that they may be able to tell orthodox archaeology something of value. The fringe is interesting and entertaining in its own right. This site can only scratch the surface of such a huge area of human endeavour. A quick look through the comments that have been made on various pages will throw up some interesting views. In particular, you will find that our critics accuse us of arrogance, bullying, closed-mindedness, even being in the pay of governments to suppress The Truth™. We are none of these. If you return to the site time and again, you will find that we update our pages when new information comes along, correcting errors that we have made. This is something that Bad Archaeologists never do. I (Keith) have received personal abuse, insults, complaints to my employer (!) and have even been threatened with legal action over some pages and posts. I am not put off. 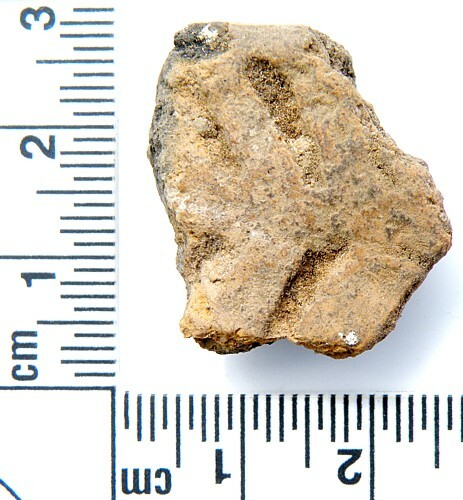 We will continue to dig away, exposing Bad Archaeology wherever we find it.